Has the media been trying to bury bad news here? Embarrassingly bad news for its enthusiasm for supposed man-made global warming, that is. Last week a team of researchers from the UK Met Office, the University of East Anglia, the University of Gothenburg, the University of Southern Queensland and the Sorbonne published in the journal Science Advances an interesting paper showing that the recent much debated and researched 21st century “slowdown” in global surface temperatures was real and could be explained by reduced solar activity and increased volcanic counteracting climate forcing from greenhouse gases. It achieved almost no media coverage despite being published in a high profile journal, writes Dr David Whitehouse @ The GWPF. Its stated aim was to “place the slowdown in a longer term context.” It chose not to use the words “pause” or “hiatus” because it says warming did not entirely cease on decadal timescales. That’s where I disagree. It depends upon when you start the decade. All the global databases clearly show that warming did cease between 2001 – 2013 (before the recent very strong El Nino), though I would advise the reader to experiment with trends by altering start and end dates to get a better picture of what is going on. Over this period HadCRUT4 for example has a trend of -0.005 +/- 0.167 degrees per decade which is statistically equivalent to no trend in any researchers notebook. The krigged HadCRUT4 has 0.051 +/- 0.185 degrees per decade, GISTEMP 0.038 =/- 0.175 degrees per decade, Berkeley 0.050 +/- 0.176, NOAA 0.044 +/- 0.185. The satellites also show the same effect RSSv4.0 TLT 0.001 +/- 0.301, RSSv4.0 TTT -0.069 +/- 0.294, UAH v5.6 TLT 0.044 +/- 0.292 and UAH v5.6 TTT -0.070 +/- 0.291. See graph here. 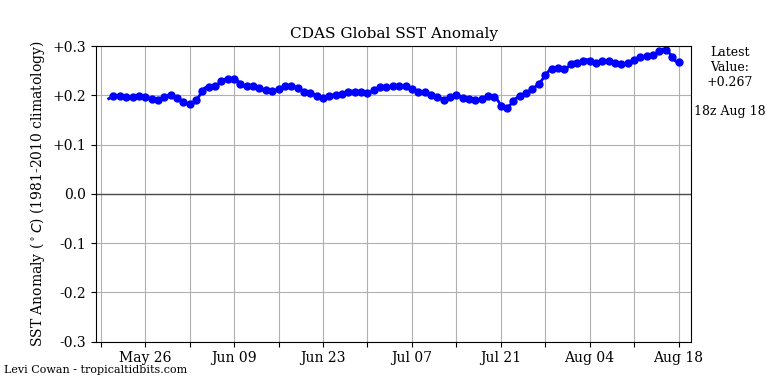 From 2001 to 2013 it is flat and after that period the El Nino takes over. Because of this the post-2001 period contains no information that can be extrapolated backwards to see if it is a continuance of previous warming statistics. It is a true break with the warming before it. Some maintain that you can take the data starting in 1980 (the start of the most recent warming period) and fit a linear trend to it and maintain there is no slowdown whatsoever. They should take up their position with these scientists who say there was a slowdown. Perhaps it would be interesting to read this paper alongside the famous Karl et al paper in 2015 that removed the slowdown by upgrading an ocean temperature database. It hasn’t stood the test of time, has it? Funny isn’t it, how science works. Cooling can be caused by various things like the sun or volcanoes, but warming can only be caused by one thing. Rebellion in the ranks of those ‘fine’ institutions or is it a half hearted attempt on the part of those institutions to wow back from the brink of oblivion when what they have said before is exposed for what it is – a scam. OK then, you suggest that warming can be caused by something else. Would you care to justify this please? It’s not water vapour – needs higher temp to get more water vapour so cannot get this without additional heat.. 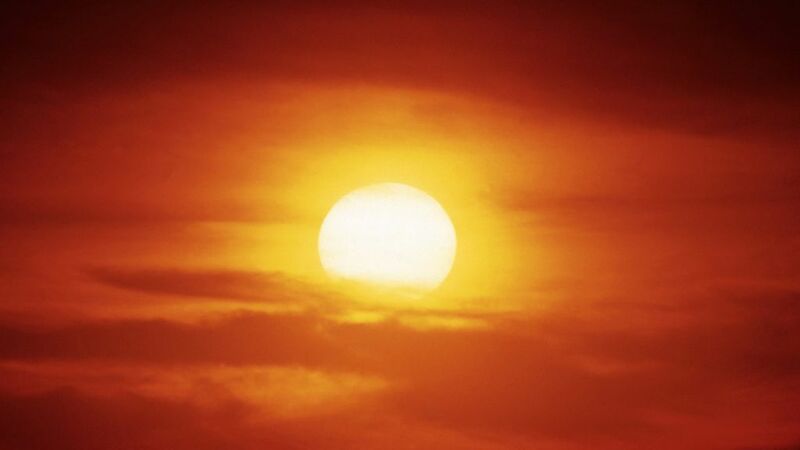 In the 200-year history of Sun-weather studies, a large body of information has accumulated. Even though the reported results have sometimes been confused, disjointed, and contradictory, there has emerged a growing belief that there are connections between changes on the Sun and changes in the lower atmosphere. There is, however, a deplorable lack of acceptable physical mechanisms to explain those probable connections, and this has prevented widespread acceptance of the reality of solar activity effects on the weather and climate. The discovery of viable mechanisms will strengthen the scientific basis of Sun-weather relationships and may lead to improved predictions of weather and climate. It’s increasing but temperatures aren’t. One pointer. In the 50’s and 60’s the local wind was prone to bursty instability. In ground school in the early ’70s downbursts was the big thing and many plane crashes were caused by “microburst downdrafts”. Then “The Great Pacific Climate Shift” happened. Winds settled and the air became more stable. We had the fewest air fatalities ever, including some years of zero crashes. Then, about 2000, things shifted back. I’ve posted my observation that the winds are back. Tree leaves shimmer again. It is more bursty. We’ve also had an uptick in plane crashes. Not a full return, as tech is better now, but no longer zero. IMHO, this all indicates a change in VERTICAL winds. Something not captured in the wind speed data. As a result of solar UV reduction and resultant shortening of the atmosphere (observed by NASA recently ~2000; who also observed greater satellite drag as the air puffed up in the late ’70s and early ’80’s). Take home message from the paper: since 1890 there have been two rapid warming periods and three cooling/slowdown periods. The 1911-1940 rapid warming was due mainly to GHGs but with significant contributions from TSI and internal variability. The 1976-97 warming was almost all due to GHGs. The mid century cooling was due mainly to anthropogenic aerosols and the 21st century Pause was due mainly to a decrease in TSI. What an absolute joke. Another AGW fudge of a paper designed with the sole intention of fitting observations to the preferred theory, giving only scant attention to the large structural uncertainties involved in reconstructing past natural forcings. Um, higher wind speed increases evaporation and thus water vapor without increased heat. Thefordprefect. So your argument is that it must be CO2 even though there is no evidence that it is, because we don’t anything else? Because if you have the evidence it is CO2, why are your arguing by exclusion of other potential causes? That works if you can show that we have a very, very good understanding of climate and how it works and what drives it. Since we continually show how very little we do know, making the argument from the point of knowing lots just doesn’t work. Got into the attic early this morning to do a little electrical work. It was nearly 10ºF cooler than in the house. A drop of some 80-90º up there from yesterday at noon. All this fuss over a temp delta around a tenth of the attic differential over decades. Instead of focusing on whether the trend is up or down, perhaps it should shift to how such cycles may be necessary for life to exist. Got it! All warming is CO2, but cooling we can blame everything else because… reasons. – to name a few solar phenomena. For reasons not fully understood by scientists, the weeks around the vernal equinox are prone to Northern Lights. Canadians walking their dogs after dinner, Scandinavians popping out to the sauna, Alaskan Huskies on the Iditarod trail—all they have to do is look up and behold, green curtains of light dancing across the night sky. Spring has arrived! This is a bit of a puzzle. Auroras are caused by solar activity, but the Sun doesn’t know what season it is on Earth. But the Earth is crossing the Sun’s equatorial plane aka ecliptic at the equinox (hence the name) in spring (vernal) in the northern hemisphere. Looks like a big clue? TFP is another missing variable fraudster. Diminished cloud cover 1980-1998 let more solar shortwave into the oceans. There’s you “global warming”. The cloud over the earth reduced global temperatures. In 1992 and 1993, the average temperature in the Northern Hemisphere was reduced 0.5 to 0.6°C and the entire planet was cooled 0.4 to 0.5°C. The maximum reduction in global temperature occurred in August 1992 with a reduction of 0.73°C. Swedish Researchers Confirm 20th Century Warming “Does Not Stand Out” Over Past 2500 Years! I agree about TFP, but what about the sun/cloud cover and ocean energy storage/release? Quote from oldbrew (June 13, 2018 at 3:06 pm): “But the Earth is crossing the Sun’s equatorial plane aka ecliptic at the equinox (hence the name) in spring (vernal) in the northern hemisphere. Looks like a big clue?”. At the equinoxes all gravitational pull from oblate shape acts along the ecliptic; more concentrated. An aside: In that figure tilt is at 23.4deg. Change that to ~14deg and many things new begin to happen. The sun does not need to do anything special, just behave as normal. One needs to look out of the box; after all this is science (only religion sticks to the dogma; which it can do with a big enough stick). There are reasons for doing that. Your list is most incomplete (see other comments above) and over-simplistic in it’s assumption of one determining factor in climate’s chaotic processes. The known history of climate shows we can not completely or very accurately describe what has happened previously. You apparently are not considering that some dynamically variable set of small factors could be (chaotically) linked to produce the outcome of today. A dynamic process who’s overall effect is greater, or lesser, than the sum of it’s parts. From observations, nature tend to act this way — building-up chaotic dynamic dependencies and processes that sometimes move towards high instability before being controlled by a damping down feedback (often multi-part) mechanism. As man’s knowledge of the climate’s processes are incomplete and probably littered with errors, (e.g. How the oceans and the clouds operate on the climate system is not well defined. ) I feel your idea to reduce climate effects (and specifically the modern very moderate warming (or lack of cooling)) we see today as being caused by a single controlling variable is unlikely. The last point is why shouldn’t the earth’s temperature not be 1, 2 or 3 degrees above what it was recently? Where in nature is the correct global temperature defined? The last El Niño has released a lot of heat from the oceans. Low solar activity does not allow the sea surface temperature to rise. Galactic radiation is approaching the 2009 level. 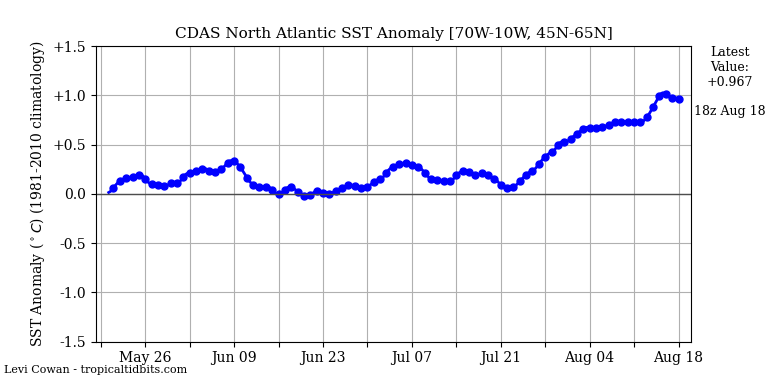 You need to pay attention to the low temperature of the Atlantic above the 45th parallel. that’s the $64,000 dollar question that no one among all the raving nutters pimping for AGW has EVER answered. Just try to get the blog ravers on other sites to answer that question. They’ll immediately either attack you personally or segue to some totally different idea, often via references to ‘authorities’ speaking on other subjects that do not answer the question.